So Don Jr. tweets the following, which is an excellent troll. So I thought I'd bite. The reason is I just got through debunk Democrat claims about NetNeutrality, so it seems like a good time to balance things out and debunk Trump nonsense. The issue here is not which side is right. The issue here is whether you stand for truth, or whether you'll seize any factoid that appears to support your side, regardless of the truthfulness of it. The ACLU obviously chose falsehoods, as I documented. In the following tweet, Don Jr. does the same. It's a preview of the hyperpartisan debates are you are likely to have across the dinner table tomorrow, which each side trying to outdo the other in the false-hoods they'll claim. This is true, but it's obviously not due to Trump. 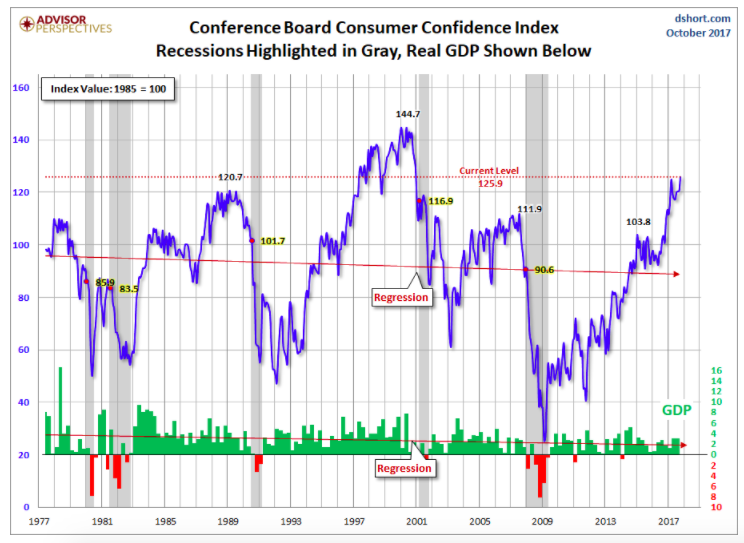 The stock markers have been steadily rising since the Great Recession. Trump has done nothing substantive to change the market trajectory. Also, he hasn't inspired the market to change it's direction. 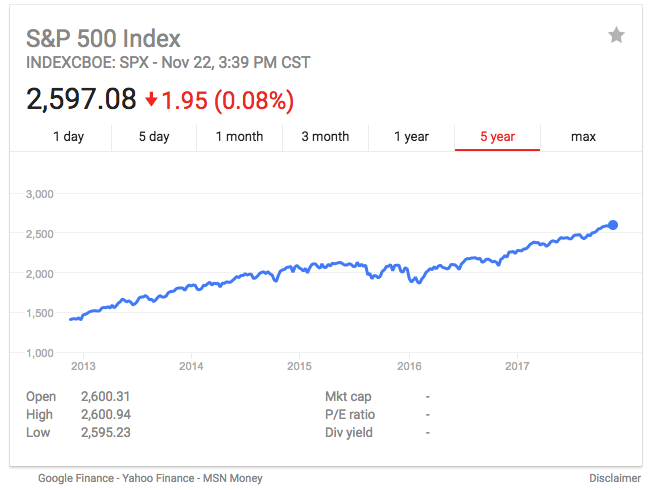 To be fair to Don Jr., we've all been crediting (or blaming) presidents for changes in the stock market despite the fact they have almost no influence over it. Presidents don't run the economy, it's an inappropriate conceit. The most influence they've had is in harming it. As we can see, jobless claims have been on a smooth downward trajectory since the Great Recession. It's difficult to see here how President Trump has influenced these numbers. What he's referring to is that assets have risen in value, like the stock market, homes, gold, and even Bitcoin. But this is a well known fallacy known as Mercantilism, believing the "economy" is measured by the value of its assets. This was debunked by Adam Smith in his book "The Wealth of Nations", where he showed instead the the "economy" is measured by how much it produces (GDP - Gross Domestic Product) and not assets. GDP has grown at 3.0%, which is pretty good compared to the long term trend, and is better than Europe or Japan (though not as good as China). But Trump doesn't deserve any credit for this -- today's rise in GDP is the result of stuff that happened years ago. Assets have risen by $6 trillion, but that's not a good thing. After all, when you sell your home for more money, the buyer has to pay more. So one person is better off and one is worse off, so the net effect is zero. Actually, such asset price increase is a worrisome indicator -- we are entering into bubble territory. 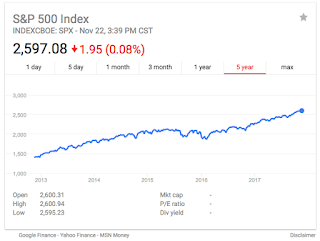 It's the result of a loose monetary policy, low interest rates and "quantitative easing" that was designed under the Obama administration to stimulate the economy. That's why all assets are rising in value. Normally, a rise in one asset means a fall in another, like selling gold to pay for houses. But because of loose monetary policy, all assets are increasing in price. The amazing rise in Bitcoin over the last year is as much a result of this bubble growing in all assets as it is to an exuberant belief in Bitcoin. When this bubble collapses, which may happen during Trump's term, it'll really be the Obama administration who is to blame. I mean, if Trump is willing to take credit for the asset price bubble now, I'm willing to give it to him, as long as he accepts the blame when it crashes. As you'd expect, I'm going to debunk this with a graph: the numbers have been falling since the great recession. Indeed, in the previous period under Obama, 1.9 fewer people got off food stamps, so Trump's performance is slight ahead rather than behind Obama. Of course, neither president is really responsible. 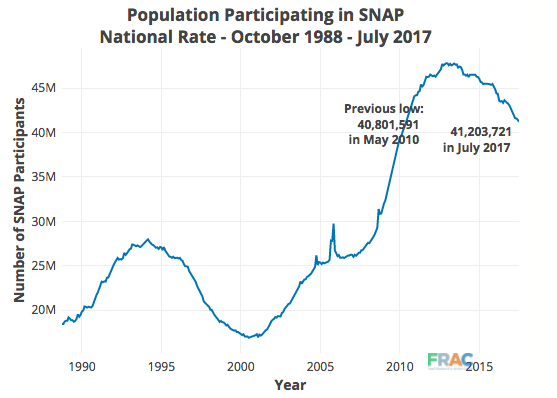 Again we find nothing in the graph that suggests President Trump is responsible for any change -- it's been improving steadily since the Great Recession. One thing to note is that, technically, it's not "through the roof" -- it still quite a bit below the roof set during the dot-com era. Again, let's simply graph it over time and look for Trump's contribution. 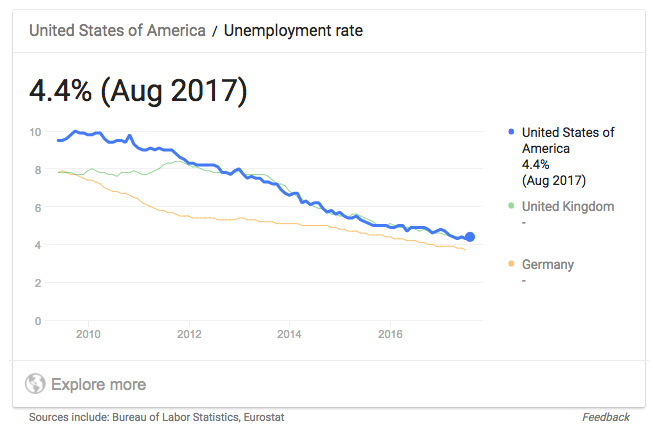 as we can see, there doesn't appear to be anything special Trump has done -- unemployment has steadily been improving since the Great Recession. 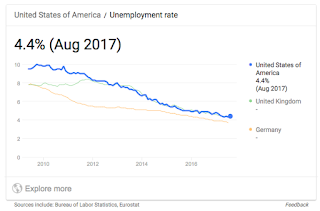 But here's the thing, the "unemployment rate" only measures those looking for work, not those who have given up. The number that concerns people more is the "labor force participation rate". The Great Recession kicked a lot of workers out of the economy. As we see, Don Jr's tweet is a troll. 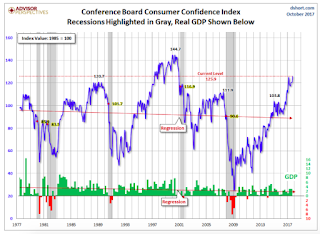 When we look at the graphs of these indicators going back to the Great Recession, we don't see how President Trump has influenced anything. The improvements this year are in line with the improvements last year, which are in turn inline with the improvements in the previous year. To be fair, all parties credit their President with improvements during their term. President Obama's supporters did the same thing. But at least right now, with these numbers, we can see that there's no merit to anything in Don Jr's tweet.